Here is an entire metropolitan capital city smack in the middle of established Europe with barely any roads or cars. Whilst car lovers may not be making a beeline to visit this place, many others like us are! A few years ago, we set foot on this mystical place of Marco Polo, floating gondolas and the masked carnival parties (yep, the masks from the film Eyes Wide Shut where made here!). We visited this city of over a hundred islands, all scattered about what seems like a big massive lagoon. 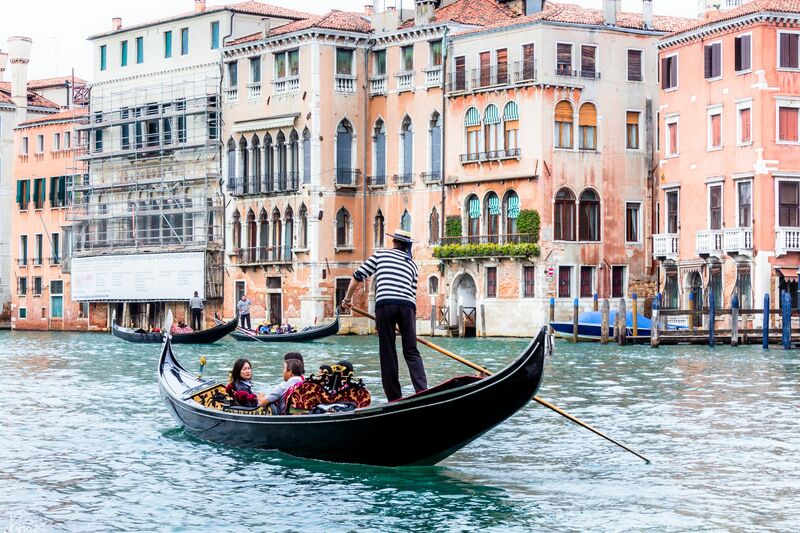 Following is a glimpse of the wonderful modes of transportation you can expect visiting Venice today. Venice is a beautiful city, and it continues to sink underwater. Rising sea levels, shifting in the Adriatic plate, ground compaction and the wash from large ships regularly sailing by are some the of main reasons why. Saint Mark's Square continues to flood on occasion. Flooding here was up to some 1.5 meters (5 feet) in recent years - when some 70% of Venice was under water. Be comfortable with deep water canals and the sea. 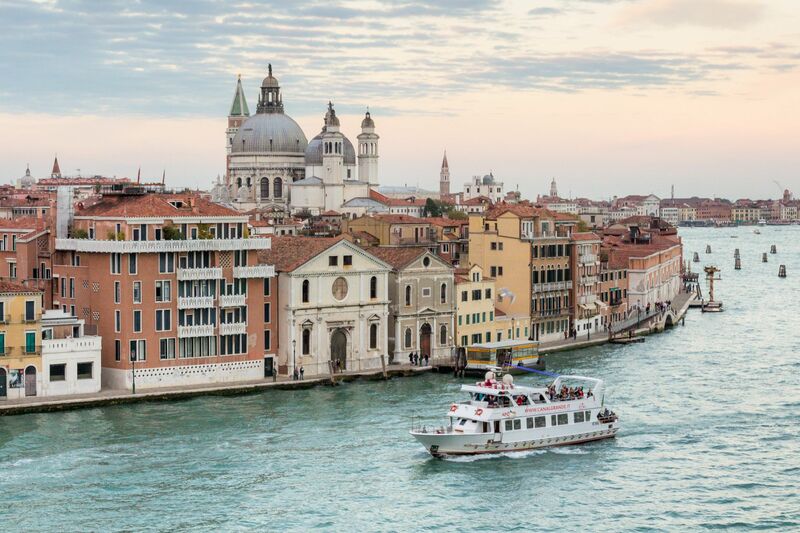 Make Venice your friend. 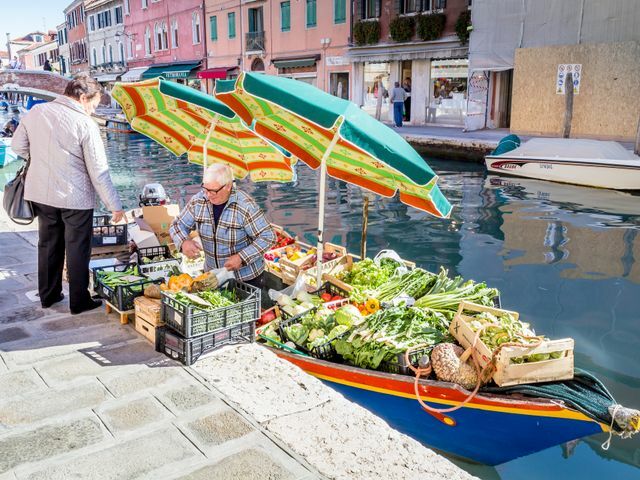 Venice is a great place to embark (and disembark) on a week's tour of ports along the warm Mediterranean ocean. Make your reservations and climb aboard a modern day passenger mega cruise ship (floating building?). These mammoth ocean beasts are some 3 times bigger than the (historic) Titanic, and can be over 10 storeys high (above sea level). Grab a glass of delicious Italian vino and get out on the balcony. Leave port from Venice with a most unforgettable send off, from a longest line of people see you go from the shoreline. Bon voyage! For the others amongst us, style is priority. Perhaps you have an acquired taste. 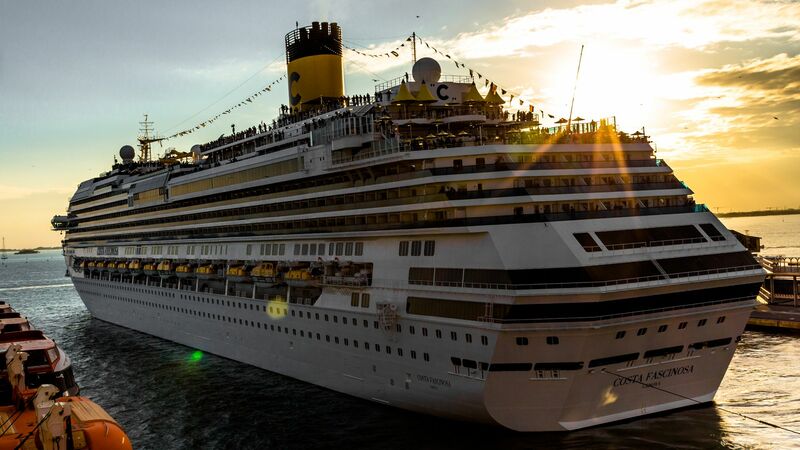 Mega-liners loaded with 4,000 other people, plenty of activities, party pools and restaurants galore are not quite your thing. In which case, you should step on board a super-yacht - see photo below (yes, it's the bigger boat). You will be charting new waters here - as I have not quite figured out how to afford a ride on one of these, yet! One way to get to or from Venice is via motorised boats. These comfortable inexpensive rides ferry you between a nearby town and this lagoon. If you are one of the few visiting Venice with a car, well yes, you can bring that in too. Park it on "garage island", or ferry it across to the Lido sand bar. There you will find one of the few nicely tucked away beaches of this lagoon. When visiting a new city, and time permitting, taking the local bus makes the trip just a little more local and adds "flavour" to your travel experience. This is no different for Venice. However, the "buses" here come with no wheels attached. 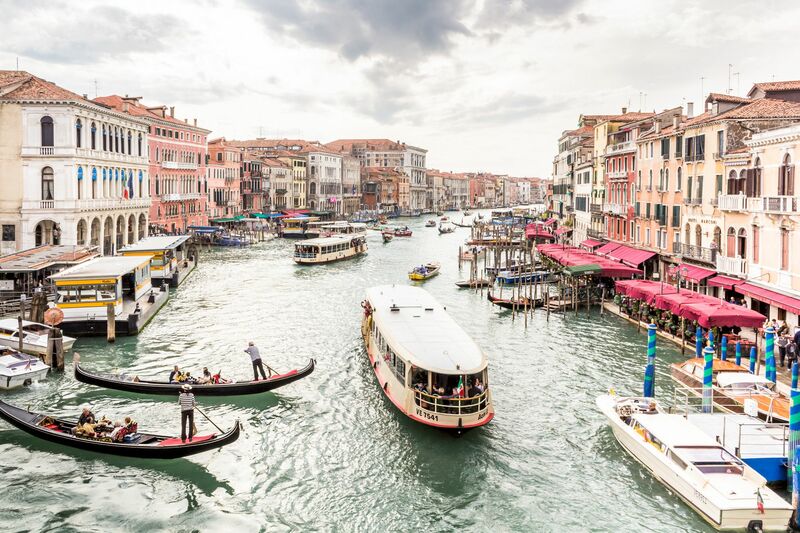 Experience floating through the heart of Venice along its Grand Canal on the city's most popular bus, the often packed vaporetto #1. 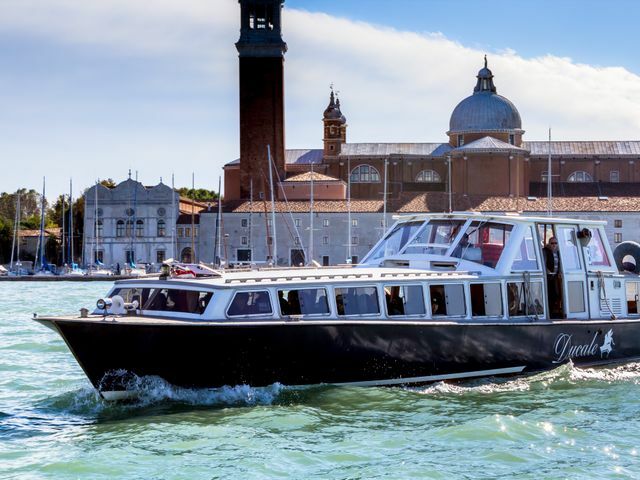 If you are short on time and looking to get from the train station to the main square (Piazza San Marco) quickly, vaporetto #2 will be your express service. Just like most modern day cities, there is a "subway" map for Venice showing the vaporetti routes too! 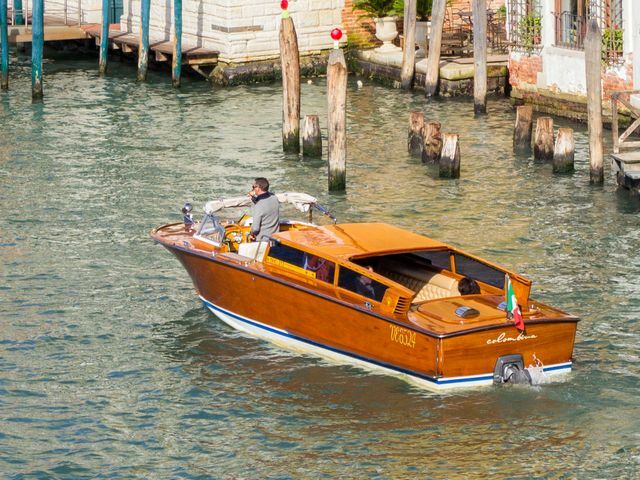 The most special boats in the whole of Venice, are a world renown timeless classic which requires no introduction. Ok, if you are trying to rekindle the flame, are on your honeymoon, or even (yes, I have seen this .. ) getting married in Venice, you will need to get on this pinnacle of a private water ride. This comes with optional live a cappella music, and you will be in serious-splurge mode. It is time to feast your eyes on the shiny pitch black gloss of the polished Venetian gondola. Is a romantic ride on these beauties too expensive? Never. It is a once a lifetime experience, priceless! Sharing a ride with others? Seriously, that's lame .. unless you are a student, or are simply with the whole family (grandpa and all, of course). 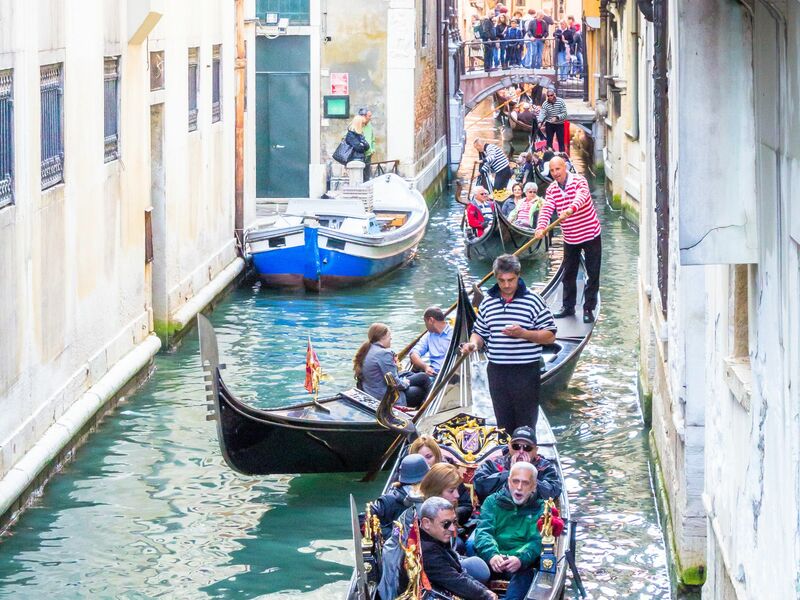 Research your price for a gondola ride before heading there though. Avoid surge pricing periods if you can (in the evenings/nights). Definitely negotiate your ride duration, vocals and price before stepping in. Ok, now sit back, relax and enjoy the lovely ride through the back streets of Venice, serenaded by a charming local in a burglar suit with your amore. So, some of us will simply not be able to afford the super steep price to be admired with the sheen in a sleek romance glider. In which case, do seek out the much cheaper (seriously @ 2 euros) traghetto. These traghetti look like oversized gondolas (without the posh), rowed by two gondolieri. These longer boats are meant for crossing the Grand Canal during daytime, at places where there are no bridges. 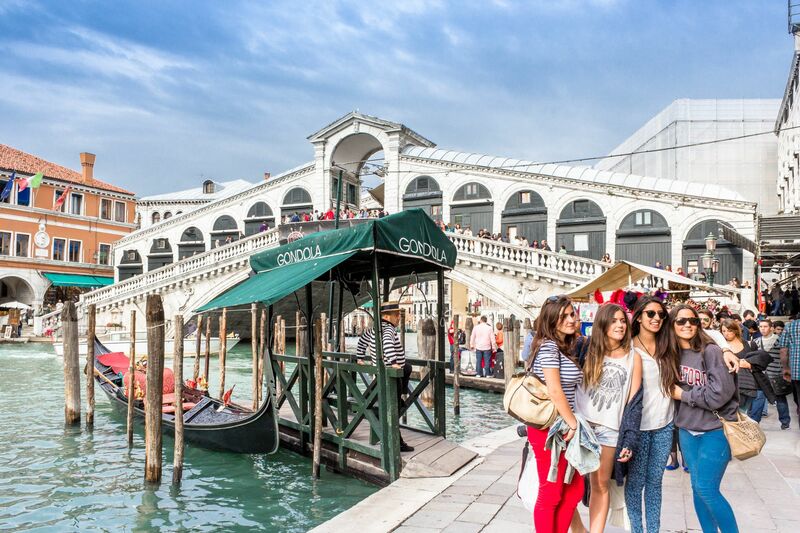 Speaking of bridges, head over to the most famous bridge in the whole of Venice - the Rialto Bridge. Get some of your best Instagram photos by this historic bridge. At the top of this bridge is an amazing view of the Grand Canal. From here, you will see many of the local boats. Well, I hope you enjoyed your mini tour of transportation. Following are just a few more boats you might see during your time in this enchanting place. I really enjoyed my short time in Venice and riding on the water. Personally, if I had to pick my most favourite ride of all, and that is not easy .. it would be on the posh brown leather seats (sofa?) of the small luxurious white/brown water taxi which took us (with our bags) from the train station to our hotel. I suspect that this ride stole the show for me because there is nothing in this world like riding into Venice for the first time at sunset, on a floating limousine, like 007, in true James Bond style without the sails ..